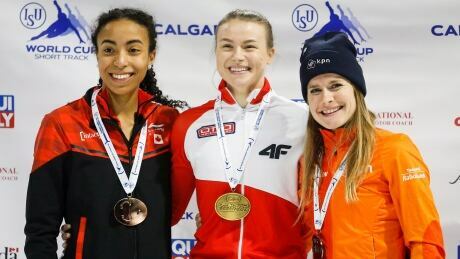 Canada opened up the short track World Cup season on a strong note, grabbing two medals in Calgary on Saturday. Courtney Lee Sarault won bronze in the women's 1500-metre, and Alyson Charles took home bronze in the women's 500. On the men's side, Pascal Dion and Samuel Girard both took part in the 1500, with Dion finishing sixth, and Girard winning the B final. The rest of the event will finish off Sunday, and will be streamed live on CBCSports.ca.